Been looking for a gladius these days, and that prompted me to check out Deepeeka products. I never thought much of the brand, especially compared to Hanwei/windlass competing in the same price range. 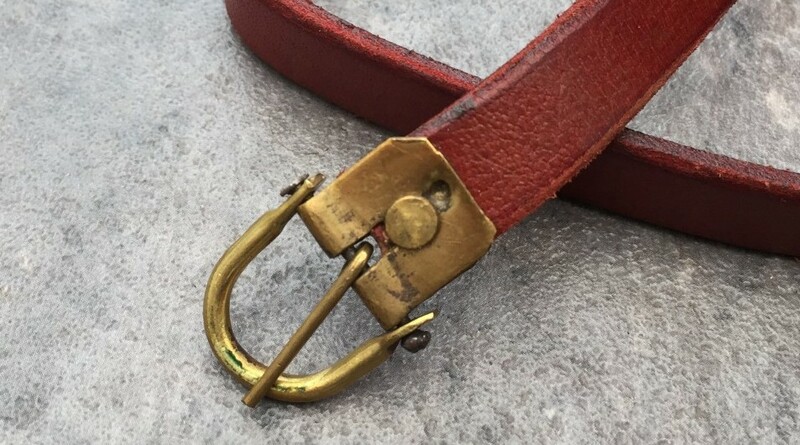 Their medieval line looked especially bad - but their roman products were said to be fine - prized as entry level items in the reenactment community. It was said they had upgraded their products, they have launched a "primus" line, with a claim to greater quality and historical accuracy. I decided to give a Deepeeka gladius a go, and found a very cheap euro retailer in Hamburg. While doing so, I checked out other products, and to my great surprise I found many worthy of interest. Simply put - I'm blown away by the value for money. Sword is solidly put together, pinned, the guard is flawless (save for a tang slot that could have been thinner).I find that Knobbed guards on production swords have always been poorly made - not the case here. The grip is very well executed - as suspected, veg tan leather, with cord imprint - a very neat seam on one side. The blade is well made with (relatively) straight lines. No excessive waviness and a very prominent mid rib section. This sword remind me very much of some seen on Durer woodcuts (especially with its rounded tip). Even the scabbard is made of quality materials (veg tan - leather core). Very nice seam on the back, deep, rich brown dye. One catch - handling is rather terrible, but bear in mind this is the stage combat version with 2 mm thick edges. The pommel is not substantial enough to counterbalance such a beefy blade. I can't make a blade with such a central ridge, but I can certainly tweak it - I will grind down the edges and sharpen the tip, and I'm pretty sure it will do the trick. very closely based on a Royal Arnoury piece (pic below). Again, at 50$, I'm stunned by this little dagger. I simply can't fault it. It's almost a carbon copy of the original. It feels very robust, the blade is very nicely done with a nice satin finish. The brass plate is well fitted, as well as the riveted pommel cap. Nice little leather scabbard, holds the dagger very firmly in place. Top notch. And finally, the gladius that started it all. Same verdict. Everything is well made and firmly put together. The scabbard is rather stunning, the brasswork is very fine and detailed. The straps are veg tanned, fitted with a buckle. The blade is very evenly made, has a nice finish, and is very imposing indeed. The hilt is equally nice, even the bone handle is facets are very even. Guard and pommel woodwork is very precise as well. No sign of glue between components, Nothing sloppy and no shortcuts. 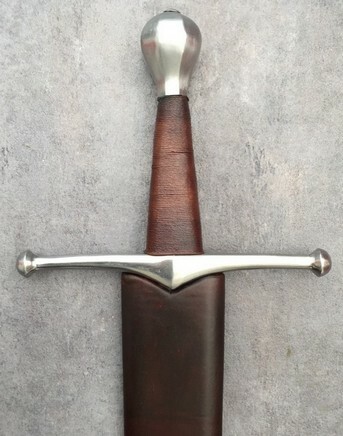 The hilt does feel a tad bulky - but my knowledge of these short swords is too shallow to say for sure. I need to check originals in museums to make up my mind. Light as a feather - it handles beautifully. Had I ordered just this piece, I would have been delighted. But the sword and dagger have stolen the show for me. I'm just not sure gladius are my cup of tea - too obsessed with medieval/renaissance arms really. Might grow on me. Wow! Those are some great project swords, and even some that look good right out of the box. That single hand reminds me of one I built ages ago, inspired by Talhoffer. The Deepeeka looks like it could be just right for that period. Check out the new stuff from GDFB, too! That rondel really does look nice I think. Good review, nice to hear about these pieces. Thanks for the review, Julien. 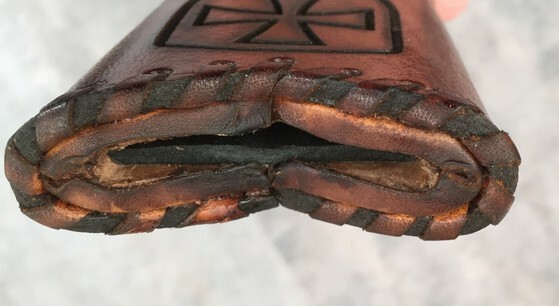 The $150 question: how's the heat treatment on them? Well at this price point inconsistent quality control is always a possibility. I doubt this would be an issue for the dagger, which is 1 cm thick in section. 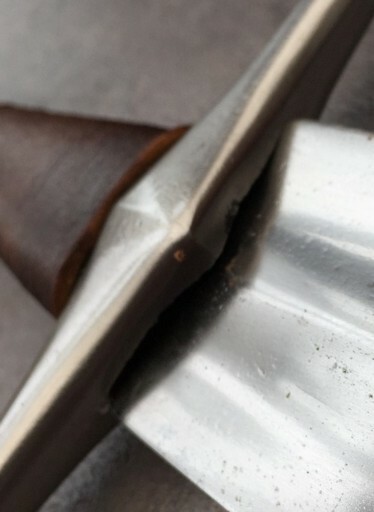 I can bend the blade of the sword - but not much due to the thick mid section. without destructive tests this will be hard to assess. Actually, it looks like they have a number of new products that look interesting. - Light Combat "F" model is hardened and tempered, has thick edges (1.5mm - 2mm thick) and Tip of the sword is rounded off. - Regular "R" model is hardened and tempered, no thick edges, no rounded tip. I too have the Fulham and it compares well with my Matt Lukes. 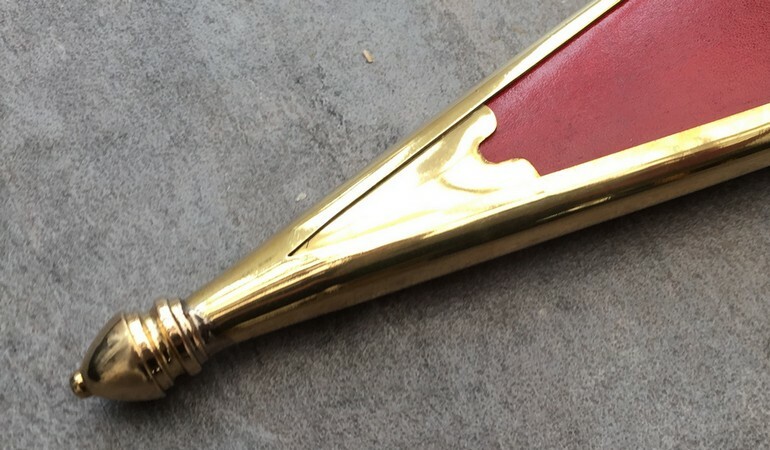 Of course an $800 example is going to be more authentic than a sword at 20% of the price, but the Deepeeka is more than a decent example of this type. My blade shape is a bit different than yours and that's what Deepeeka needs to focus on, consistency. 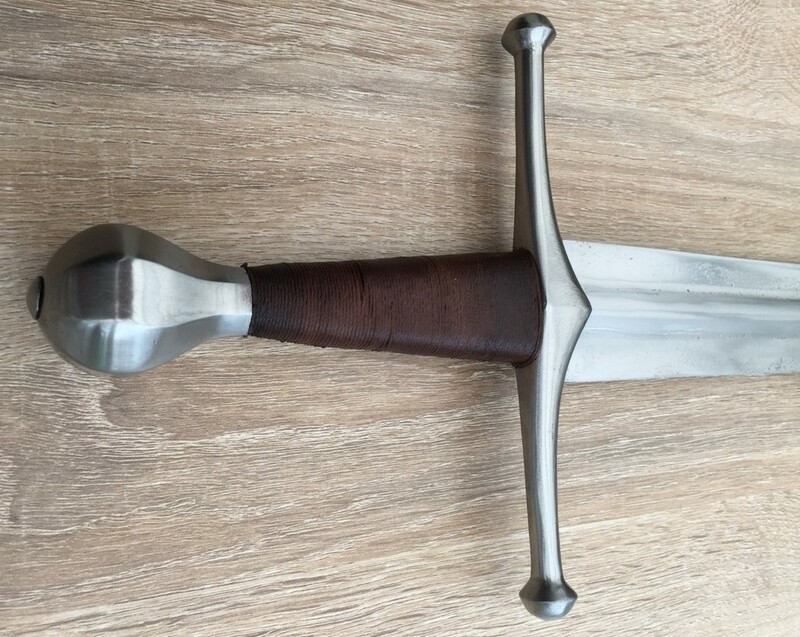 Even at their low prices it's important to get the blade shape and hilt shape you see online. I know they are working on upping their quality and it's good to see that they are improving. The blade has a good bit of flex, but I have yet to push its limits. Personally, I wouldn't be doing flex tests to find out about heat treatment. You really only learn something if it fails, and even then, you don't learn much. Sure, if you don't know whether a blade has been heat-treated at all, then seeing if it takes a set at a small bend can be useful. But if you know the blade is heat-treated, then what are you trying to find out? For example, optimum tempering for spring steels for use in springs usually leaves it with a hardness in the HRC40s. So if you want a blade with hardness in the HRC50s, and you test by flexing, you only learn it's a good blade if it fails the flex test (by breaking?). A brand new file pretty well sings off of the blade, and it has taken-and kept-a decent edge. I will definitely find out when finishing the profile and setting up and edge. I've modified dozen's of entry level pieces and working from something that features plenty of material to remove has its advantages (I'll be able to carve out a reinforced tip for instance, there is more than enough thickness to work with). For now I've just refined the pommel edges (which looked like it was grinded by someone who had one too many drinks). But easy to correct. I also removed the scabbard mouth with the ugly templar-ish burned out pattern. Looks way better already. I find that little sword absolutely awesome and will definitely take it to the next level. Removed the scabbard throat, buffed hard and re-dyed dark brown, managed to blend the upper part with the rest. 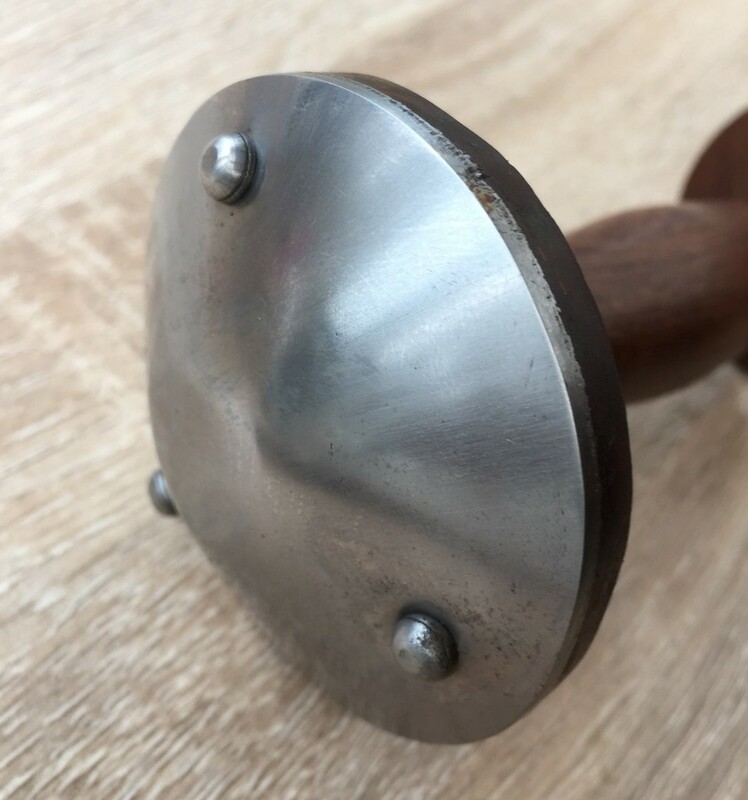 Looks way better already - with straps and a proper shape (I have a bunch of windlass shapes lying around that will fit just fine, it will look the part.